Copper Roof Verdigris Bluebird Birdhouse-White Vinyl 24 in. x 6 in. 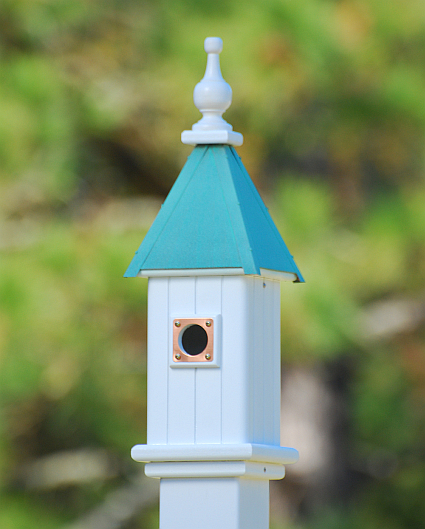 Copper Roof White Vinyl Birdhouse-PVC material requiring no maintenance. Never needs to be painted. Always looks beautiful and an architecturally pleasing design. Verdigris Copper Roof 6" Bluebird Birdhouse - Measures 24" high x 6" wide, square shaped, PVC construction, 1 nesting compartment with 1-1/2" opening for attracting bluebirds, wrens, chickadees, titmice, nuthatches and other small songbirds, copper portals, mounting base attached, removable solid copper roof for easy cleaning, fits on 4" x 4" vinyl sleeve post which fits over 3 1/2" x 3 1/2" pressure treated wood post. The beautiful copper roof is easily removed for easy cleaning. This classic birdhouse will not rot, crack split or fade and is guaranteed by the manufacturer. Will fit on top of a 4 x 4 post that can be found at most home improvement stores. Also Available with a shiny copper roof.